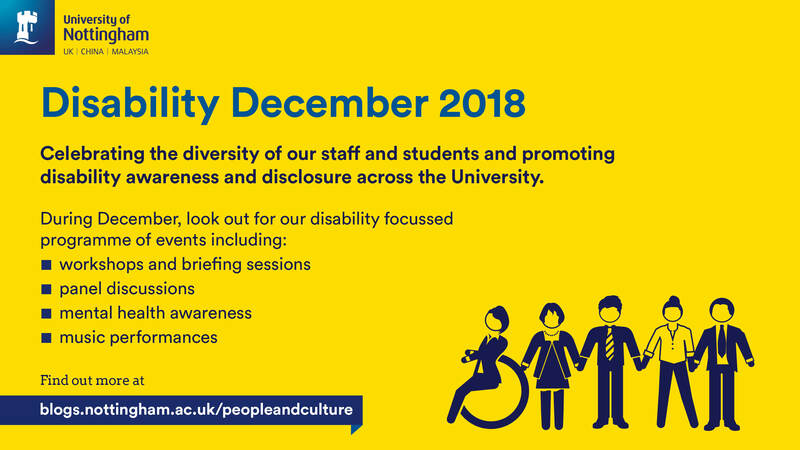 During December 2018 the University of Nottingham will be celebrating Disability December with a range of events for staff and students including workshops, panel discussions, music performances and more. A workshop for managers of staff with autism and hidden disabilities. Join us and learn how to engage with the essential eight key executive functions every person uses, as well as developing some important communication frameworks. Booking required. Find out more. Attend this talk and panel discussion to learn more about the types of mental health problems associated with the workplace and find out what the University of Nottingham is doing to support staff and students to manage and improve their mental wellbeing. A series of Disability December workshops offered by Professional Development. Times available on request – subject to demand. David Ross Sports Village / Jubilee Campus sports facility. Instructors will work with disabled staff on whatever their ambitions are – whether that be training for a race or keeping active to help manage their condition/disability. Enquiries should be sent to hannah.webber@nottingham.ac.uk. Hourly slots available. Free to members, £3 per session for non-members. Email hannah.webber@nottingham.ac.uk to book your place. £5 per couple. All welcome. Free to attend. To book please call 0115 846 7777. Donations will go to ‘Music and Memories’ and the continuation of the Dementia Choir in 2019. Other events may be announced throughout the month. For full listings, please visit the University’s events page. You can subscribe to the People and Culture blog for further updates. Guidance for line managers: Would you know what to do if a member of your team declared a disability? See this Sway produced by our Employment Relations Team for guidance. For more details, guidance for line managers on ‘Supporting Disabled Staff’ is available on the Equality and Diversity web pages. Why it’s important: Declaring a disability and discussing it with your line manager enables you to access reasonable adjustments. If you haven’t done so already, providing your personal details in MyView will help the University better understand the diversity of our staff. To do this, please log in to MyView and go to ‘Equality Monitoring Data’. “But you don’t look sick!” – Don’t let the fear of other people’s reactions stop you accessing support.